Dr. Dottavio and his wife sign waivers to enter the haunted house. 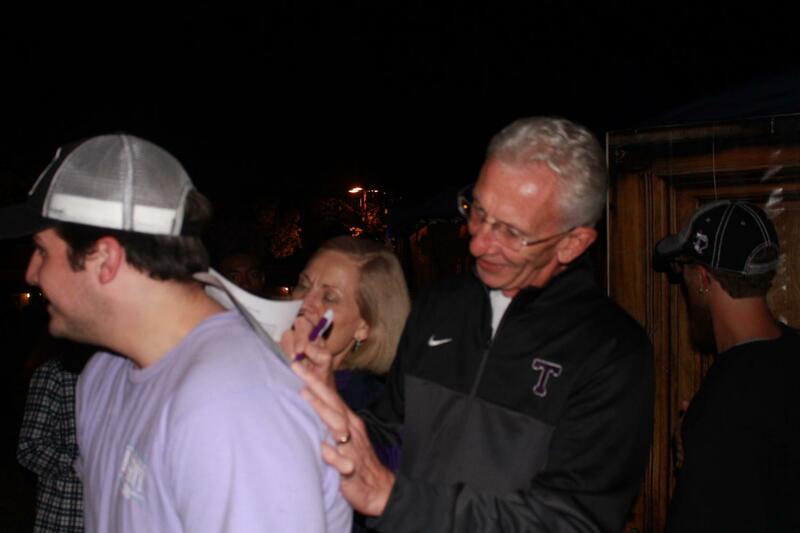 On Oct. 16, Tarleton Activities Board hosted its first event in Heritage Park. 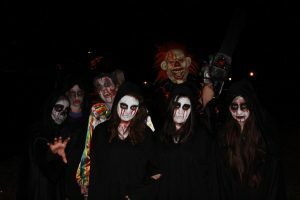 A haunted house, featuring strobe lights, sound effects and frightening screams from its gruesome residents, filled the cool night. 10 outdoor tents, arranged into a 30 feet by 40 feet rectangle in the center of the park, were wrapped with a vinyl tarp and depicted the eroded walls of a quarantined house and had “WARNING,” “KEEP OUT” and “QUARANTINE” signs plastered onto them. This haunted house invited anyone who dared to walk through its front doors. With many students wanting to experience the thrill, and many more being convinced by their friends to join them, the haunted house experienced a very long line that stretched from the entrance to the sidewalk adjacent to the Will Tate Military Memorial at the back of the haunted house. While waiting for their turn, many visiting students anticipated what was to happen. “I was excited to see how [my friends] would react,” commented Molly Koeck. Other visitors began to have second thoughts. “I heard the screaming, and I was like, nope,” commented Madison Steger. “No clowns, no werewolves, no to a lot of things,” Paulina Fuller said when asked what she hoped to see or not see during her trip into the haunted house. After signing waivers, visitors would walk through the front door, be welcomed with the front door slamming shut behind them, and begin their tour through the never-ending maze-like interior. As they stepped through the house, visitors would feel an odd sensation of someone, or something, following behind them. As they stepped in each room, they would find either hanging bodies, deformed spiders or masked puppets that may or may not have looked in their direction as they were leaving. Near the end of the tour, visitors would find themselves in a tight spot, as they had to shimmy their way through a narrow, dark hallway, and found themselves in the children’s nursery, or what’s left of it. Once visitors find the light at the end of the house, they might have felt relieved that it was over, but may not have been prepared to face the chain saw-wielding clown right behind them. Hearing the revving of the motor, visitors booked it towards the light, trying to avoid the grasp of the clown and escape from the house once and for all. Running through the thick fog and the dangling slashed curtains that obscured their vision, visitors would make it to the light and find themselves back in Heritage Park. After going through such a thrill, many visitors had mixed feeling about their visit, ranging from very impressed to very scared. With such a high volume of approval, students were not the only ones who were impressed by T.A.B.’s haunted house. 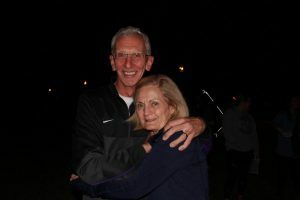 During their evening walk, President F. Dominic and Dr. C. Lisette Dottavio saw the activity going on in Heritage Park and decided to join in. With many visitors leaving with a satisfied, and possibly scarred, look on their faces, T.A.B.’s haunted house was an enormous success. Part of this is thanks to Kenny Barzee, Show Host for Simplified Entertainment. Barzee would like to thank T.A.B. 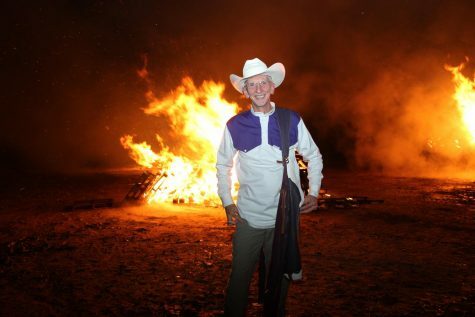 and Tarleton for not only having him and his company host the haunted house event, but for also ensuring that the set up and execution of the event went as smoothly as possible. “I’ve been doing this for five and a half years, and from the time that I got here, everything went so smoothly. I had five helpers to help me set up, 10 volunteers in the haunted house, and when it’s time to take down, [T.A.B.] 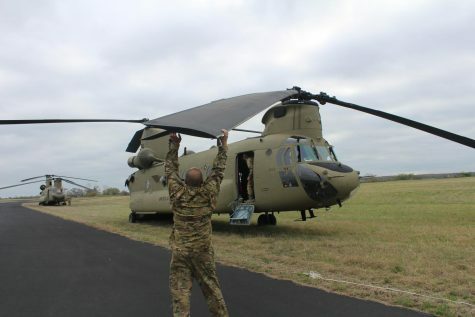 said they’ll give me another five or six to help me take down. 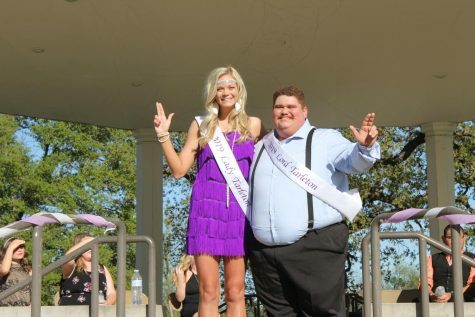 They also fed me, and gave me a Tarleton Hat,” Barzee said. 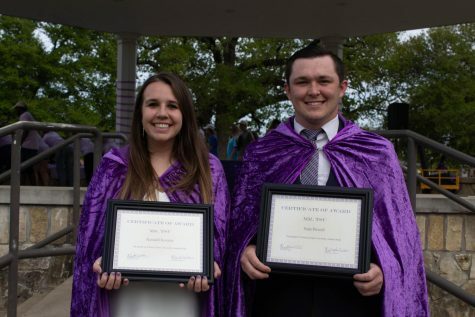 Tarleton Activities Board members are also responsible for making the haunted house event possible. 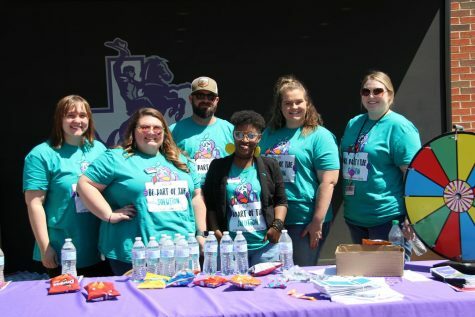 “A lot of people don’t know who we are yet,” said Timothy Musick, Senior Intern for Student Involvement, Tradition, Spirit and Family Relations, and one of four executive members tasked with starting T.A.B. “So, what we wanted to do is get one event that was extreme, that we could bring people to, bring people together and have our name get out there”. Volunteers who got to scare students who dared enter the haunted house. “I think this has been an extremely successful turnout,” Musick said. Musick said they started off with 400 waivers, but T.A.B. had to print 300 more when they began to run short.